Previous Post Ready for Valentine’s Day! Lovely cards – I like the cupid one too! 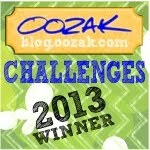 It’s perfect for the Oozak January pink + bling challenge. So glad you were able to play along with us!